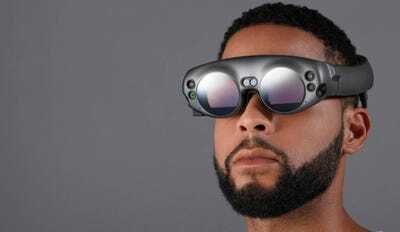 After six years of hype videos and nearly $US2 billion in funding, the secretive Florida startup that’s backed by the likes of Google and Alibaba finally unveiled its first product late last year: Magic Leap One. 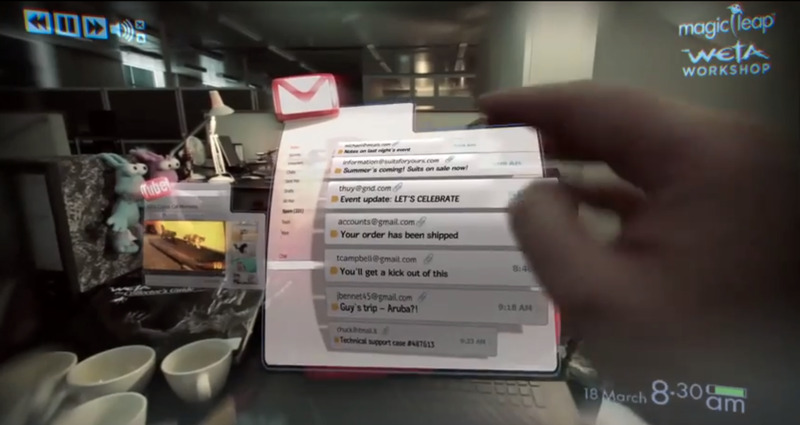 Magic LeapThe Magic Leap One is an augmented reality system. But, uh, what is it? Magic Leap One is a futuristic-looking augmented-reality headset that’s powered by a small, circular computer that hooks onto your belt. All the stuff that your smartphone does? It does that stuff, but it does it within your field of view. Instead of looking at your phone for email, you can project your email right into the world in front of you (where only you can see it). First things first: This is an example of augmented reality, powered by Magic Leap’s new device. 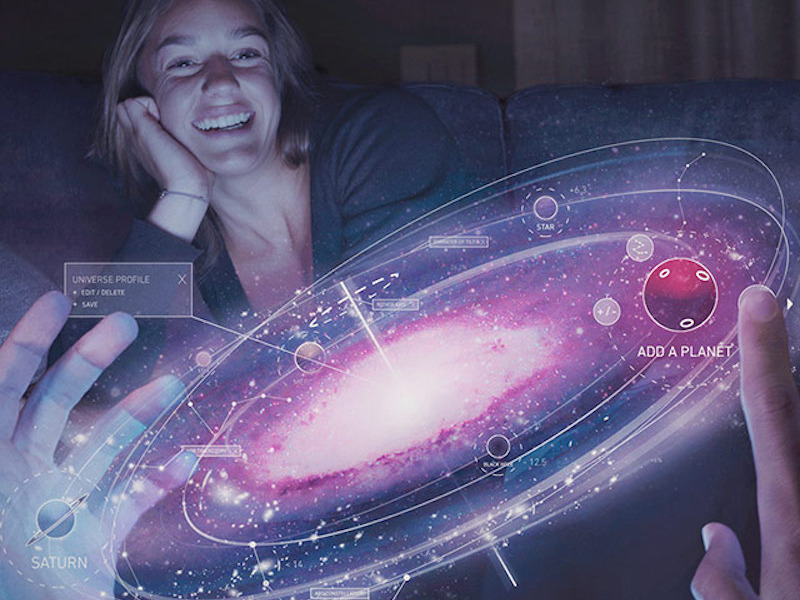 The idea is simple: Magic Leap intends to bring your online life into your real life. In the image above, for instance, you can see a user scrolling through their Gmail account. In the lower right, you can see the time and date, and a battery meter for the headset. Rather than looking down at your phone, or at your laptop (or whatever other computer device), you can straight up project that stuff into your field of view. 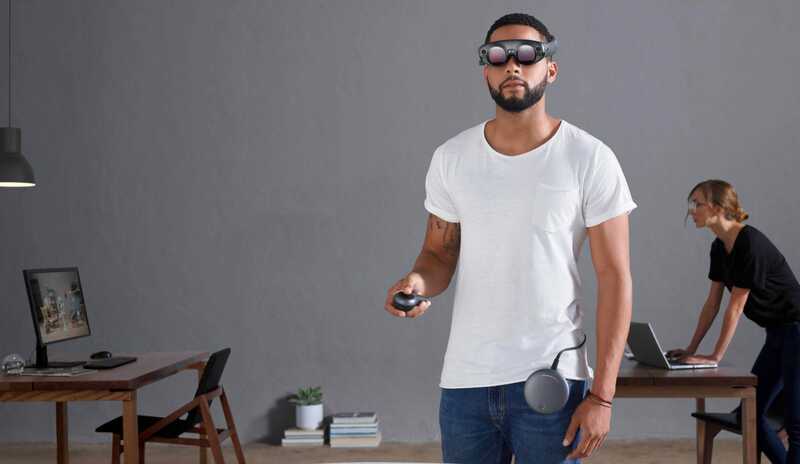 This entire setup — the glasses, and the circular thing on the left, and the controller on the right — is “Magic Leap One.” It’s an all-in-one augmented-reality system. At some point in 2018, Magic Leap plans to release the Magic Leap One augmented-reality system. There’s no price yet, nor is there a more specific release window than the entire year of 2018. We don’t even know the specs of this thing yet. What we do know is this: Magic Leap One combines a headset with a computer and a controller to enable augmented-reality experience. Sounds similar to Microsoft’s HoloLens headset, right? That’s because it’s very similar to Microsoft’s HoloLens headset. The Lightwear headset uses a mess of sensors and cameras to “see” the world around its user, thus letting you interact with the augmented reality projected through the headset’s lenses. 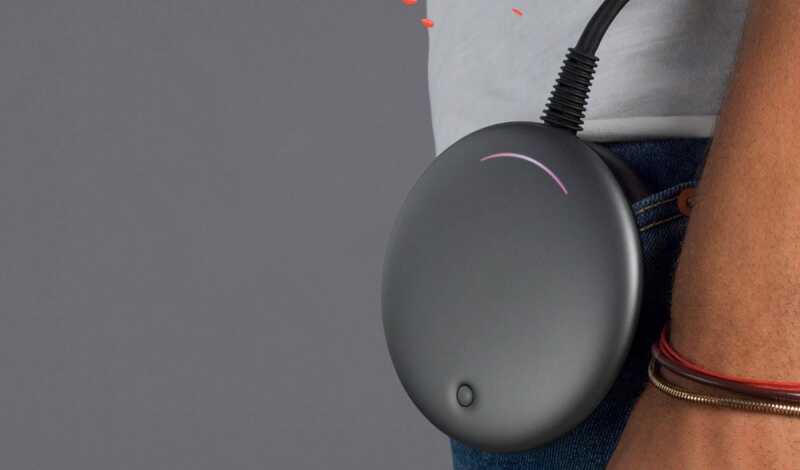 As the Magic Leap website says, the headset merges “environment mapping, precision tracking and soundfield audio.” What that means in practice is whatever you see in the world through the glasses can be interacted with. In the example above (from Magic Leap), a user has our solar system projected in the world in front of them. 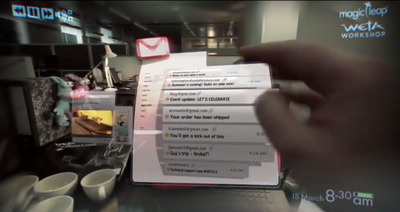 The glasses have sensors and cameras that see the user’s hands interacting with the projection. It’s not actually clear if the Lightwear headset can track hands, but this example certainly gives that impression. This is the “Lightpack” computer that powers the Magic Leap One system. Though the headset itself is likely to have some processing, the computer that powers the headset is actually separate. It’s called the “Lightpack,” and it can be clipped onto a pocket or belt, as seen above. Two wires lead out of the back of the headset, which combine into a single wire that plugs into the pack. The controller doesn’t have a name, but it’s the main form of interaction with Magic Leap One’s augmented reality. It might look like one big button, but the large black circular area is actually a haptic touchpad. That means it’s a touchpad (like the one on a laptop) and it gives feedback through vibration. It may sound simple, but those two things – combined with the ability to click the button – enable a wide range of inputs. The Magic Leap One controller is similar to the HTC Vive controller in this way, although it has blessedly fewer buttons. The light ring around the main button is likely to enable tracking, so the headset’s sensors can “see” the controller. Additionally, the controller has motion tracking. The room you see here is yet another example of how Magic Leap’s AR system works. The chairs and table and shelving are all real things, in the real world, whereas the weather and planet and satellite are all being projected into the world (for the person using the headset, at least). But Magic Leap has far more ambitious goals for its first headset. This massive jumbotron being projected into the night sky above a group of cheering fans, for instance, would only be seen through the Magic Leap One headset. 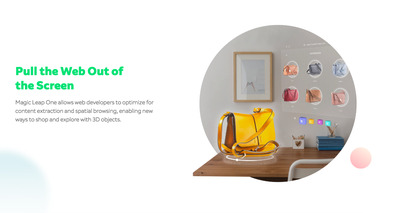 Magic Leap envisions various instances of people using AR both by themselves and with others. 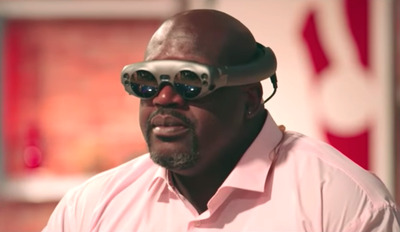 The unifying theme tying all of these examples together is that Magic Leap One will replace the screens in your life. For instance, instead of gathering in a living room to watch a basketball game together, Magic Leap envisions people getting together outside and watching on a floating jumbotron in the sky. A better example might be this solar system projected into the world — a much better way to explore a 3D image than seeing it on a flat screen. Since you can walk around (and through) the image projected into the world in front of you, exploring 3D objects – like the solar system – is especially cool in augmented reality. Magic Leap offers this example on its website, which seems a lot more realistic (if hectic). Magic Leap’s first headset will come in several sizes. 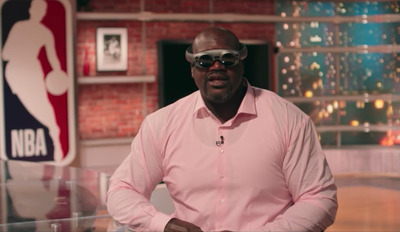 Shaquille O’Neal is not a small gentleman, but he’s capable of wearing the Magic Leap One headset. That’s because the headset is apparently coming in several sizes. “Magic Leap Large” was the name given to the size of the headset that Shaq’s wearing in the image above – the video featuring Shaq with the headset was shown this week during the Code Media conference. The first versions of the headset are going to cost a lot of money, and subsequent versions won’t be cheap either. Your definition of “high-end PC” of course matters here, but we’re ballparking that at somewhere between $US1,000 and $US2,500. Maybe a high-end PC, to you, is a MacBook Pro laptop, or maybe it’s a powerful gaming desktop. Those range in price pretty dramatically, so take that as you will. All that said, expect the first unit to be pricey in general, with prices on subsequent models coming down over time. Abovitz said he’s hoping future units are closer in price to a high-end smartphone ($US1,000 and under).